The latest efforts to shore up the nation’s engineering base start with instilling a love for math, science, and technology long before students reach college. As you well know, 3D Academy is frequently in classrooms all over Hawaii teaching middle school students about CAD and 3D technology. Owner, Collin Kobayashi, loves having the opportunity to get out into the community and help foster students’ interest in STEM education. We have come across this STEM education article on the Cadalyst website and wanted to share it with you. Once a tool that addressed a very specific professional need, CAD today is pervasive, touching just about everything that isn’t created by nature. 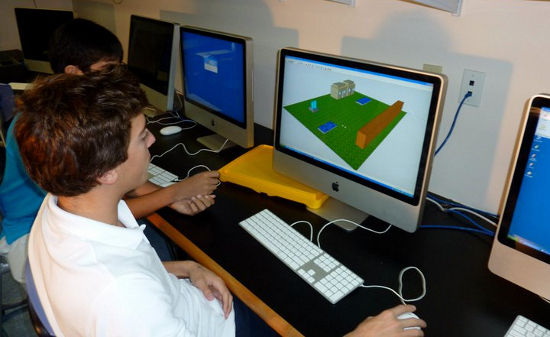 Although most think of CAD and 3D modeling as technology that’s taught at the college or professional level, it is now trickling down to high-school and even middle-school classrooms. From software including Autodesk‘s TinkerBox app to in-school curricula such as Project Lead The Way, CAD increasingly is shaping the education of America’s youth in ways that far outstrip its original application as a drafting tool. Its use is helping to shore up the country’s supply of engineers by instilling a passion for technology use at a young age — and shoring up students’ confidence in their ability to succeed. The latest efforts to shore up the nation’s engineering base start with instilling a love for math, science, and technology long before students reach college. When it comes to fostering students’ interest in a subject — or stated differently, averting a disinterest in it — current wisdom says the window of opportunity is closing by the time students finish middle school. That, together with an emphasis on the importance of teaching process and critical thinking, is what’s driving the push to introduce CAD technologies to students in the third through twelfth grades. For the past couple of decades, the news media has loudly and repeatedly pronounced the decline of U.S. students’ literacy in math and science. That lack of training in STEM (science, technology, engineering, and math) subjects has led to a shortage of qualified workers in numerous science and technology fields that is projected to grow. Last year, President Barack Obama announced the Educate to Innovate initiative, which aims to improve STEM literacy in children. It provides federal funding for STEM teaching but also relies on support from companies, foundations, nonprofit organizations, and science and engineering societies. One program that is improving STEM literacy in schools across the United States is Project Lead The Way (PLTW), a nonprofit organization that provides STEM curricula for middle and high schools that incorporates hands-on activities and project- and problem-based learning with an emphasis on developing critical thinking, creativity, innovation, and problem-solving skills. Through its Gateway to Technology program, PLTW introduces sixth through eighth graders to technology in units that explore aerospace, energy, environmental studies, modeling, and robotics. High-school students have two PLTW tracks: Pathway to Engineering and Biomedical Sciences. Pathway to Engineering coursework explores the design process and uses STEM skills to solve real-world issues. Autodesk is an industry leader when it comes to putting software in the hands of students from elementary school through college. The company offers reduced-priced software bundles for education; free software downloads for students; instructor workshops that provide tools for engaging and inspiring students; and apps such as TinkerBox, which introduces engineering principles in a fun and interactive way. In its own words, Autodesk’s goal is “to capture the hearts and minds of the next generation to get them proficient and passionate about using our products.” The TinkerBox app for the iPad, iPhone, and iPod touch incorporates science and engineering principles into a game for students. If you have any questions about CAD or 3D printing please feel free to email us at info@3d-innovations.com and we gladly answer them for you.